« *** WINNERS *** Charlotte, Sandy, Vera and Perk11 are Living the Life of Riley! CONGRATS! A recent study conducted by the Kresge Foundation and published in Health Affairs found that treating children who are exposed to air pollution, toxic chemicals and other pollutants costs a staggering $76.6 billion dollars a year. The study also found that children with existing allergies to common airborne allergens are even more vulnerable to chemical pollutants than others. Lead paint and other toxic paints. Children’s rooms should be painted only with non-toxic no-VOC paints. Even latex paints can emit toxic fumes over a long period of time, worsening allergies and asthma. Shampoos and lotions are full of chemicals. Desert Essence makes a good line of shampoos, conditioners and lotions that are chemical free. There are many things you can do to not only avoid indoor chemical pollutants but also keep your kids healthy in general. Good indoor air filtration (with charcoal and zeolite in the filters, not just HEPA filters) can help limit exposure to airborne pollutants. Give children fresh, mostly organic unprocessed foods. This doesn’t have to be complicated. A turkey sandwich with whole grain bread, Applegate Farms or Hormel natural turkey (no additives, MSG, nitrites or nitrates—both big causes of cancer), and an organic apple are a great lunch, rather than packaged “cracker and cheese” or many of the items that are currently offered in school lunches. Stay informed about air and water quality and pollution hazards in your neighborhood and your town. 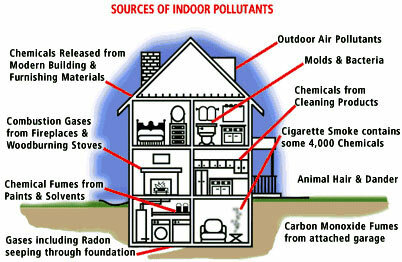 One Response to Keep Your Children Safe from Air Pollution and Toxic Chemicals By Following These Tips! Hm.. This is an interesting post. Very useful! Thanks a lot for sharing this! Celebrate Valentine’s Day with DIY Bath and Beauty Gift Ideas!